Nominated for two Hoopie Awards! 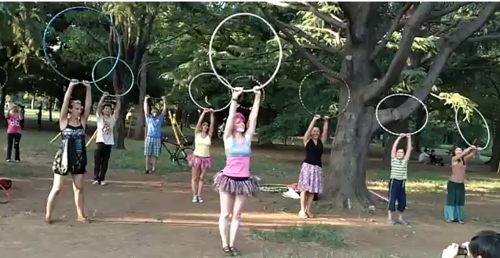 On a whim last summer, I dreamed up and acted on a project for World Hoop Day: a choreographed hoop dance that would be done around the world. It came together beautifully over the next few months. I made video tutorials for people to learn the moves. I taught the dance in the park and in the classroom. I lost a hoop to the trains. Stina, D, and I performed the dance in front of my heros and fellow hoopers at Hoop Camp. And then it all culminated in October with a public dance performance in 17 locations worldwide on World Hoop Day and a compilation video of the scores of happy hoop dancers who took part. And now the event and the video are both finalists in hooping.org’s annual Hoopie Awards. I am gobsmacked to have something I worked on recognised this way. You should see the list of nominees. It is a Who’s Who of the hooping world. Wow. I am so very proud of everyone who participated in the dance. There were hoopers from almost every continent - so many people took the time and effort to learn it, share it, perform it, and video it. Thank you from the bottom of my heart to all the dancers and to the folks who nominated the WHD Dance for the Hoopies. If we win a Hoopie, it is a group honor for everyone who joined in and supported the project. And if we don’t win a Hoopie, it is still a great pleasure to have been nominated and make it to the finalists. Let’s give ourselves a hand regardless. Yay, us!! You can see all the inspiring hoopers up for awards and vote at Hooping.org until 9pm PST on Friday. Oohh - I think I took that photo.